Cancun is a busy and highly developed tourist area, with restaurants, shops, and clubs galore in its famous 24-kilometer Hotel Zone. Many families stay at all-inclusive resorts in Cancun or at one of the luxury (non-all-inclusive) resorts that embrace family vacationers. But just a short distance away is the laid-back Isla Mujeres, which makes an easy and enjoyable day trip from Cancun. Take an inexpensive 20-minute ferry ride from the dock at Puerto Juarez, close to downtown Cancun. Ferries run every half-hour. Find a seat on the top deck and enjoy the view plus some live musical entertainment during the ferry ride. The dock area at Isla Mujeres where the ferry from Puerto Juarez arrives is about as busy and developed as things get on this island. After that 20-minute ferry ride, Cancun is a world away. Isla Mujeres is a small island, less than five miles long and less than a half a mile wide. 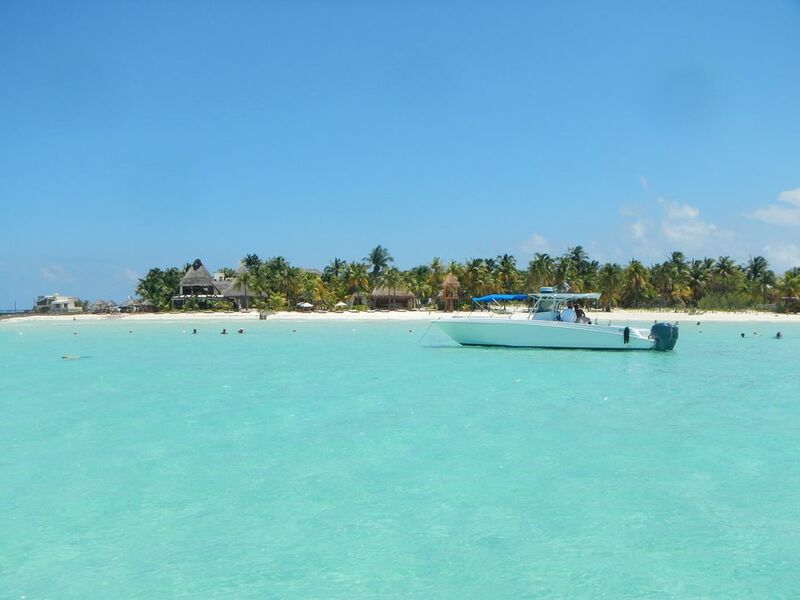 From the dock, you can walk to Playa Norte (North Beach) or explore small streets lined with shops and restaurants. You can also sign up for snorkeling excursions and can rent a golf cart to explore the island. Families with older kids can also rent bikes. A golf cart or bikes make it easy to discover more of the island beyond the lanes and beaches closest to the ferry dock. Keep an eye out for whimsical and quirky sights and stop for a meal or drink at one of several interesting restaurants. Garrafon Natural Reef Park has a beautiful setting near the southern tip of Isla Mujeres, but the name is somewhat misleading: The focus of this park is activities, and admission is sold as packages that include restaurant meals and various activities. You can swim in the sea or pool, kayak, snorkel, bike, or try the zip-line. Garrafon also offers dolphin encounters. Some of these activities require small extra charges. Plan to spend several hours at the park to make the admission fee worthwhile. Punta Sur is the southern tip of Isla Mujeres. Drive your golf cart as far as the road goes, for about 15 minutes, and you'll arrive at the parking lot for Punta Sur. For a modest admission price, you get a view of dramatic cliffs, turquoise sea, and a Sculpture Garden. If you're at Garrafon you can reach Punta Sur by a walkway along the cliffs. While at Punta Sur you can also walk out to a small temple that's dramatically perched over cliffs and sea and dedicated to Ixchel, an important Mayan goddess. If the heat is too much for you, drinks are available on-site at Punta Sur's restaurant where you can also order a meal. Don't be surprised if you see iguanas sunning near the path that leads to the temple. Take a lunch break at a laid-back beach restaurant with tables and chairs right on the white sand. Playa Lancheros, for instance, has tables under palapas, and fresh seafood is a specialty. Isla Mujeres has a busy little commercial area full of shops within walking range of the ferry dock for a little island retail therapy. The Italian owners of the gelateria moved from Bologna to create this little shop on Isla Mujeres where you can indulge in real Italian-style ice cream and espresso to top off a few hours on Isla Mujeres before heading back to the ferry for the short ride to Cancun.